A short film shot in Dripping Springs will receive red carpet treatment next month. “Chasing Grace,” a film written, produced and directed by Austinite Julia Barnett, will make its world premiere March 10 at the 2017 South by Southwest Film Festival in Austin. For Barnett, the chance to show her film on a renowned stage is an exciting venture. What it could do for Dripping Springs’ film future is also wide open. Barnett began preproduction for the film, which is her directorial debut, in April and eventually began shooting in August. Between that time, Barnett worked to pull together funding for the film, along with finding locations to shoot the film, as well as props and proper wardrobe. 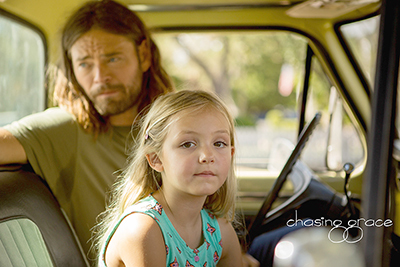 The story follows Grace, who reluctantly meets with her estranged father, only to discover the truth about the events of the “wild 70s summer that drove them apart,” according to a release. Barnett said creating the authenticity of a small Texas town in the 1970s was one of the primary focuses during pre-production, filming and editing. She received assistance from area residents, who lent her ’70s era items and wardrobe to include on the shoot. She also received help from Austinites Kathryn and Kyle Chandler, who donated a 1970s era pickup truck. Barnett and her film crew also received the help of many Dripping Springs residents and business owners during the process. She said filming in a small town is “so wonderful” and she appreciated the generosity of residents. Principal filming began in August and ended several weeks after. During that time, the Chandlers helped seek locations in the Dripping Springs area. Those included the Dripping Springs administration building, Dripping Donuts and Hudson on Mercer. Once filming was complete, Barnett began the editing process. She enlisted the help of an editing company out of Austin, which is associated with SXSW. She also hired a Fort Worth based musician to help score the film. The challenge, however, was cutting and editing a film that was near and dear to her heart, ensuring the film was cut down to the 11-minute runtime necessary to be a part of the Texas Shorts Competition. Barnett now eyes post-production for the film, which includes sound editing, color correction and final production costs. Barnett started a gofundme page to crowdfund the final expenses. So far the film has gathered roughly $4,700 of the necessary $9,000. The possibility of additional exposure is what she hopes to gather at SXSW. Exposing Dripping Springs to the film industry could follow. “There are a lot of small towns in Texas, but what is special about Dripping Springs is that it’s so close to Austin, so you can work with many industry professionals,” Barnett said.